In 2018 Sense of Place presented two new exhibitions, both of which opened at venues in Leeuwarden. At the city’s Aegon building and the De Kanselarij ‘open community’. 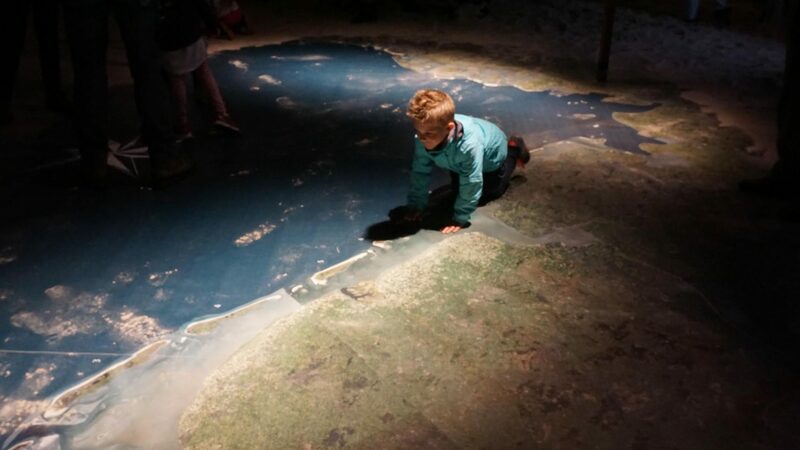 Be amazed by the dynamics of the tide in ‘de Waddenkelder’ (the Wadden Basement): Bare feet in the sand you will experience the cycle of the tide in one minute. An ode to the Wadden Sea: slums, sandbanks, mudflats, beaches and dunes. A dynamic landscape, constantly in motion. Unique in the world and from 2009 a Unesco World Heritage site. The Wadden Sea has always been influenced by man. Places of Hope is a wonderful stage for the innovative Sense of Place projects. These projects make it possible to experience the dynamics of the Wadden Sea and its beauty and poetry even more intensely. The projects respect culture and nature and tell the story of the location and the landscape. They give the place extra appeal and meaning: a Sense of Place. In the Wadden Basement you become aware of the vulnerability, the beauty and the unique character of the ever-changing Wadden Sea landscape. This project was made possible by ‘Programma naar een Rijke Waddenzee’, the municipality of Leeuwarden and Leeuwarden-Fryslân 2018. Bruno Doedens (1959) studied at ‘de Academie van Bouwkunst’ in Amsterdam, specialising in Landscape architecture. In 1990 he wins the ‘basisprijs Prix de Rome’ – Landscape architecture. Together with Maike van Stiphout he starts bureau DS in 1993. They win the international contest for designing two parcs at the Potzdamer Platz in Berlin. Both have been realised. In 2005 Doedens continues on his own, from 2007 as initiator and artistic director of Slem. Besides expertise and crafts, the focus in all his projects lies on illusions. The fascination to ‘make the impossible possible’, or ‘to turn water into wine’, and the focus on the long term and the social and cultural values, predominate.